This article is about the region of New Zealand. For other uses, see Northland (disambiguation). 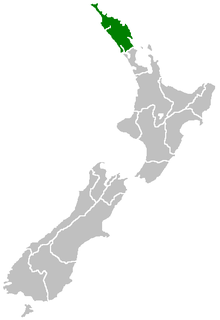 The Northland Region (Māori: Te Tai Tokerau) is the northernmost of New Zealand's 16 local government regions. New Zealanders often call it the Far North or, because of its mild climate, the Winterless North. The main population centre is the city of Whangarei, and the largest town is Kerikeri. The Northland Region occupies the northern 80% (265 km) of the 330 km Northland Peninsula, the southernmost part of which is in the Auckland Region. Stretching from a line at which the peninsula narrows to a width of just 15 km a little north of the town of Wellsford, Northland Region extends north to the tip of the Northland Peninsula, covering an area of 13,940 km2, a little over five per cent of the country's total area. It is bounded to the west by the Tasman Sea, and to the east by the Pacific Ocean. The land is predominantly rolling hill country. Farming and forestry occupy over half of the land and are two of the region's main industries. Although many of the region's kauri forests were felled during the 19th century, some areas still exist where this rare giant grows tall. New Zealand's largest tree, Tāne Mahuta, stands in the Waipoua Forest south of the Hokianga Harbour. These kauri forests are also home to Te Raupua (781 m), the highest point in the region. The western coast is dominated by several long straight beaches, the most famous of which is the inaccurately-named 88 km stretch of Ninety Mile Beach in the region's far north. The slightly longer Ripiro Beach lies further south. Two large inlets are also located on this coast, the massive Kaipara Harbour in the south, which Northland shares with the Auckland Region, and the convoluted inlets of the Hokianga Harbour. The east coast is more rugged, and is dotted with bays and peninsulas. Several large natural harbours are found on this coast, from Parengarenga close to the region's northern tip, then Whangaroa Harbour, and past the famous Bay of Islands down to Whangarei Harbour, on the shores of which is situated the largest population centre. Numerous islands dot this coast, notably the Cavalli Islands, the Hen and Chickens Islands, Aorangaia Island and the Poor Knights Islands. The northernmost points of the North Island mainland lie at the top of Northland. These include several points often confused in the public mind as being the country's northernmost points: Cape Maria van Diemen, Spirits Bay, Cape Reinga, and North Cape. The northernmost point of the North Island is actually the Surville Cliffs, close to North Cape although the northernmost point of the country is further north, in the Kermadec chain of islands. Cape Reinga and Spirits Bay, however, have a symbolic part to play as the end of the country. In Māori mythology, it is from here that the souls of the dead depart on their journey to the afterlife. Northland is New Zealand's least urbanised region, with 50% of the population of 179,100 living in urban areas. Whangarei is the largest urban area, with a population of 52,600 (June 2018). The region's population is largely concentrated along the east coast. During the five-year period up to 2006, Northland recorded a population growth of 6.0 percent, slightly below the national average. Northland includes one of the fastest growing towns in New Zealand, Mangawhai, which is expanding rapidly because of residential and subsequent commercial development. The region of Northland has an oceanic climate (Cfb in the Köppen climate classification), but a subtropical climate in the Trewartha climate classification with warm humid summers and mild wet winters. Due to its latitude and low elevation, Northland has the country's highest average annual temperature. However, as with other parts of New Zealand, climate conditions are variable. In summer, temperatures range from 22 °C to 26 °C, occasionally rising above 30 °C. In winter, maximum temperatures vary between 14 °C and 20 °C. Ground frosts are rare due to the region being encircled by the moderating Pacific and Tasman waters; however, light frosts do occur infrequently around Dargaville in the lowlands. The hottest months are January and February. In January 2009, excessive sunlight hours and below-average rainfall resulted in the region being declared a drought zone. Typical annual rainfall for the region is 1500–2000 mm but varies at different altitudes. Northland has an average of 2000 sunshine hours annually. Winds are predominantly from the southwest. Occasionally in summer, the region experiences stormy conditions from former cyclones which generally become much weaker once they leave tropical latitudes. The Northland Region has been governed by the present Northland Regional Council since 1989. The seat of the council is in Whangarei. Regional council members represent 7 constituencies: Te Hiku, Coastal North, Coastal Central, Coastal South, Whangarei City, Kaipara and Hokianga-Kaikohe. Whangarei District Council, based in the city centre. 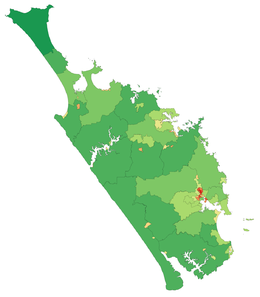 Until 1989 Northland was governed by several county and borough councils and an earlier Northland Regional Council. It was part of Auckland Province from 1853 until government was centralised in 1876. Long after Auckland Province ceased, the region continued to be known as North Auckland. A proposal to merge the three district councils and the regional council into a unitary authority was rejected by the Local Government Commission in June 2015. Māori refer to Northland — and by extension its Māori people — as Te Tai Tokerau (the northern tide) and Māori language and traditions are strong there. The Māori population in the region was 43,530 according to the 2006 Census, or 7.7 percent of the total Māori population. Their median age was 23.4 years. Major tribal groups include Ngāpuhi, Te Aupōuri, Te Rarawa, Ngāti Kahu, Ngāti Kurī and Ngāti Whātua. Several of these tribes form a loose association known as the Muriwhenua. Over the last 10 years[when?] Northland's population has defied national (and worldwide) trends by becoming increasingly rural. Approximately one third of the region's population are Māori; the majority of the remainder is of European lineage. Compared to the rest of the country, Pacific Islanders are under-represented in Northland. Although most of the region's European population are of British stock (as is true with the rest of the country), certain other ethnicities are represented as well. These include a sizeable Croatian community from the Dargaville area north, particularly around Kaitaia. Kerikeri, Bay of Islands. Stone Store at left, St James at rear, and the Mission House on the right, the country's oldest surviving building. According to Māori legend, the North Island of New Zealand was an enormous fish, caught by the demigod Māui. For this reason, Northland is sometimes referred to as "The tail of the fish", Te Hiku o Te Ika. Northland iwi claim that Kupe made landfall at the Hokianga (although others claim this was at Taipa) in the northwest of Northland, and thus the region claims that it was the birthplace of New Zealand. Some of the oldest traces of Māori kainga (fishing villages) can be found here. If the Māori regard the region as the legendary birthplace of the country, there can be no doubt that it was the European starting-point for the modern nation of New Zealand. Traders, whalers and sealers were among the first arrivals, and the gum and timber of the mighty kauri trees brought more colonisers. 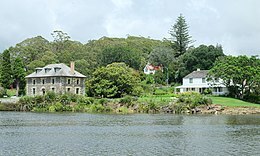 In the Bay of Islands, Russell, formerly known as Kororareka, was the first permanent European settlement and Kerikeri contains many historic buildings, including the Stone Store, New Zealand's oldest extant building. The nearby settlement of Waitangi was of even more significance, as the signing place of New Zealand's founding document, the Treaty of Waitangi between the Māori tribes and the British Crown, on 6 February 1840. The sub-national GDP of the Northland region was estimated at US$3.243 billion in 2003, 2% of New Zealand's national GDP. The region's economy is based on agriculture (notably beef cattle and sheep), fishing, forestry, and horticulture. Citrus fruit makes up the majority of the latter industry, with lemons, oranges, and tamarillos all being produced. Avocados are also widely grown, as well as kumara (especially in Ruawai part of the Kaipara district). Olives are also being grown on the Aupouri Peninsula. Extensive forests are a feature of the Northland landscape. For this reason wood and paper manufacturing industries also make a large contribution to the region's economy. The railway system, which once ran as far north as Donnellys Crossing, has been historically important for the transport of timber via Dargaville to Auckland. Northland is a favourite tourist destination, especially to the Bay of Islands and the historic town of Kerikeri. Diving and fishing are also popular visitor activities, especially around the Bay of Islands and the Poor Knights Islands. Northland is home to New Zealand's only oil refinery, at Marsden Point, close to Whangarei. New Zealand's natural fuel resources in Taranaki account for a little under half of the refinery's intake, with the rest coming predominantly from the Middle East. The nearby Marsden A thermal power station originally utilised heavy oil from the refinery for electricity production, but no longer does so. ^ Cite error: The named reference NZ_population_data was invoked but never defined (see the help page). ^ a b c "The Local Government (Northland Region) Reorganisation Order 1989". New Zealand Gazette: 2391 ff. 9 June 1989. ^ a b Orange, Claudia (13 July 2012). "Northland region - Geography". Te Ara: The Encyclopedia of New Zealand. Retrieved 5 July 2014. ^ a b "Living in Northland". Northland District Health Board. 2 March 2009. Retrieved 15 February 2010. ^ a b Orange, Claudia (2 March 2009). "Northland region - Natural environment". Te Ara: The Encyclopedia of New Zealand. Retrieved 15 February 2010. ^ "Drought confirms Northland as NZ's hottest place in 2009". The Northern Advocate. 9 February 2010. Retrieved 19 October 2015. ^ "NorthlandNZ - Climate". Destination Northland. Retrieved 15 February 2010. ^ Franklin, Samuel Harvey (1966). "North Auckland region". In McLintock, A. H. (ed.). An Encyclopaedia of New Zealand. Retrieved 5 July 2014. ^ "Proposal for single Northland council dumped". Radio New Zealand. 9 June 2015. ^ Orange, Claudia (2 March 2009). "Northland region - Overview". Te Ara: The Encyclopedia of New Zealand. Retrieved 31 August 2011. ^ Te Puni Kōkiri/Ministry for Māori Development. "Te Taitokerau". Retrieved 31 August 2011. ^ "Muriwhenua tribes". Te Ara: The Encyclopedia of New Zealand. ^ a b Orange, Claudia (2 February 2009). "Northland region - Farming and forestry". Te Ara: The Encyclopedia of New Zealand. Retrieved 15 February 2010. Wikimedia Commons has media related to Northland Region. Wikivoyage has a travel guide for Northland.